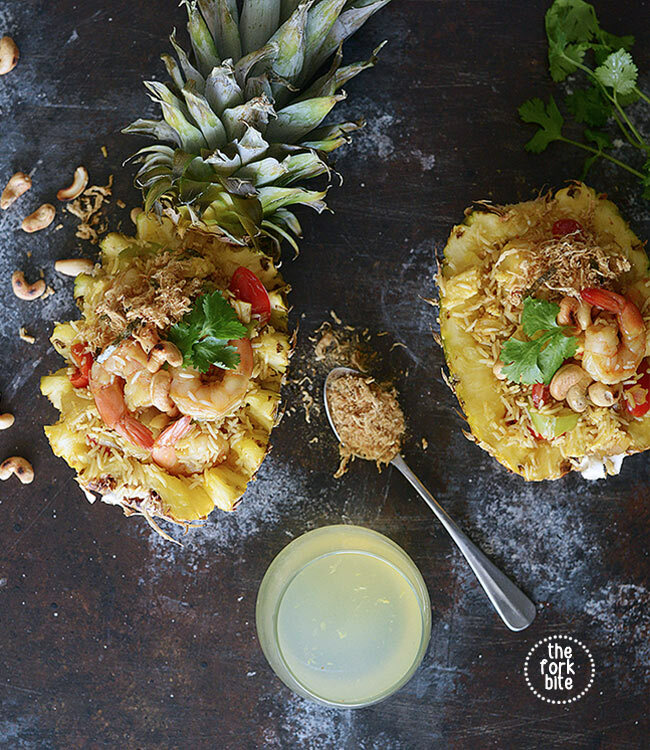 You can turn your next meal into a visit to a tropical paradise by serving Thai pineapple fried rice. This is one dish that’s great for everyone. It’s extremely flexible. 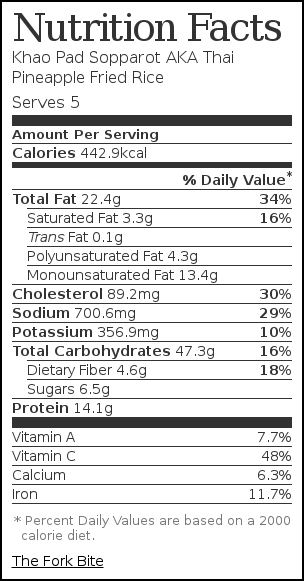 For over-vegetarians just eliminate the chicken. Strict vegetarians remove both the meat and eggs and add a little tofu or even cashews for extra protein. For everyone else, the recipe is perfect for a taste treat your family will love. 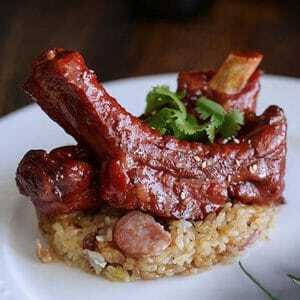 I’ve used pork and chicken but you can top it with almost any type of meat or seafood. You may have most the ingredients already on hand, but there are some that aren’t normally in everyone’s cupboard. If you’re using chicken in the rice, you’ll need a cup of it that you are bite size cubes. You’ll also need two eggs, ½ cup of each sliced sweet onion, sliced green bell pepper, sliced red bell pepper, and sliced tomato. You’ll use two types of soy sauce, thin soy sauce (two tablespoons) and dark soy sauce (two tablespoons). Healthy Boy and Golden Mountain are popular brands of both. While you’re at the grocery, don’t forget to pick up tapioca flour, you’ll just need a teaspoon, but it’s important. 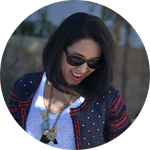 This recipe takes 5 cloves of garlic, ¼ tsp Thai pepper powder, a whole pineapple but you’ll only use one cup of fresh pineapple chunks and the pineapple shell and 1 tsp Thai curry powder, so add that to your grocery list too. You may have jasmine rice on hand. I make this recipe the day after I serve rice, making extra so I have four cups for the recipe. Besides all the ingredients mentioned, you’ll also need one tsp of each, sugar and salt and 5 tablespoons of vegetable oil. 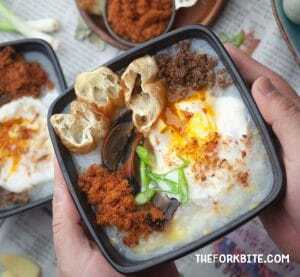 Mix the tapioca starch with one tablespoon of dark soy to marinade the chicken for about 15 minutes, scramble the eggs using two of the tablespoons of oil. Remove the eggs and add the next three tablespoons of oil, allowing it to heat before adding the garlic and chicken, add all other ingredients except the scrambled eggs, tomato, rice and a tablespoon of dark soy. Let this mixture cook for several minutes so all the ingredients blend. Mix the last tablespoon of dark soy with the rice and add it to the mixture. Cook for a few minutes and remove to serve. Right before serving to add the tomato and scrambled eggs. You can serve it in the carved out pineapple shell for a festive look and garnish it with spring onions and cilantro. 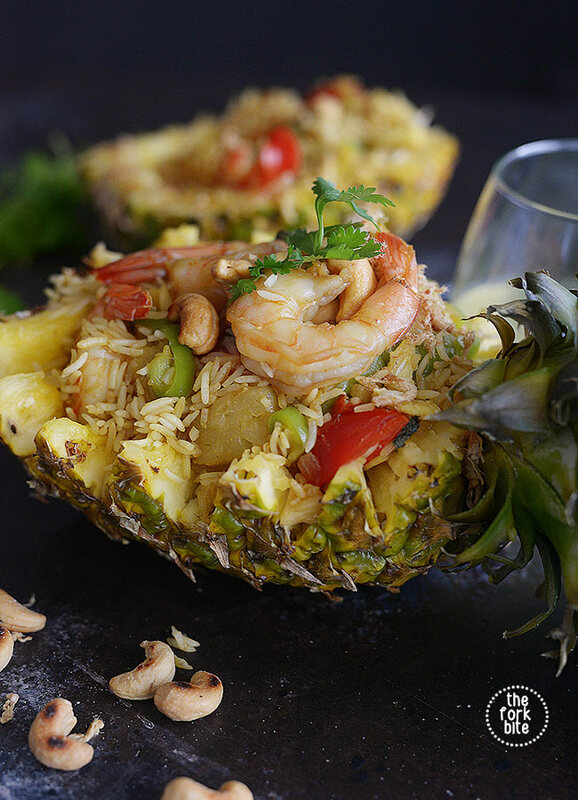 This pineapple fried rice is super easy to make, with chunks of pineapple for a hint of tropical flavor and shrimps for extra protein. In the same wok, add three tablespoons vegetable oil. Heat, then add chopped garlic. Add chicken and cook for a few minutes. Add yellow onions, red and green bell peppers, then the pineapple. Add 2 tablespoons thin soy sauce, sugar, Thai pepper powder, salt, and curry powder. Let this cook over medium heat for a few minutes, so the pineapple releases juice and flavors all ingredients. Watch for it to become juicy. Add 1 tablespoon of Golden Mountain sauce to the top of your bowl of jasmine rice, then add this to the wok. Sprinkle 1 or 2 tbsp of Maggie seasoning (optional). Mix well. Remove from heat. Add tomato, scrambled eggs, mix gently and serve. Garnish with spring onions, cilantro and squeeze some lime juice. Pinned this! It’s a great base for making variations using your leftover greens and even meat. Thanks so much for sharing. I love this recipe, super easy and had a perfect balance of textures and flavors. I’m back reading to find some recipes to put in my rotation. Thank you. The crunch of the cashews and the sweetness of pineapple are perfect match. My family loves it.. thanks for sharing. This is such a fresh version of fried rice, I love that this dish is bursting with flavors. I love Thai food and fried rice is one of my favorites. This looks so yummy I love king prawns and the presentation of the dish in a pineapple looks really nice. What a delectable looking dish. I love the idea of using the fruit for the dish, the added sweetness you get mixed into your food. 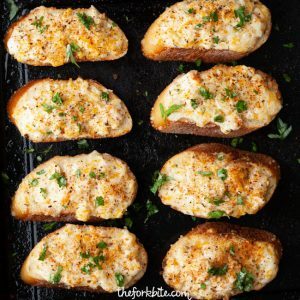 Never heard of this recipe before but I have a great feeling that it’s so delicious and satisfying! That dish looks so pretty. What a great way to display it. I think the meat would be a great contrast to the pineapple. Sounds delicious! Oh wow this meal looks amazing! It looks like it could really transport you somewhere tropical in your mind while you eat it! YUM. I adore the sound of pineapple fried rice! It looks delicious and I’m sure tastes amazing too. 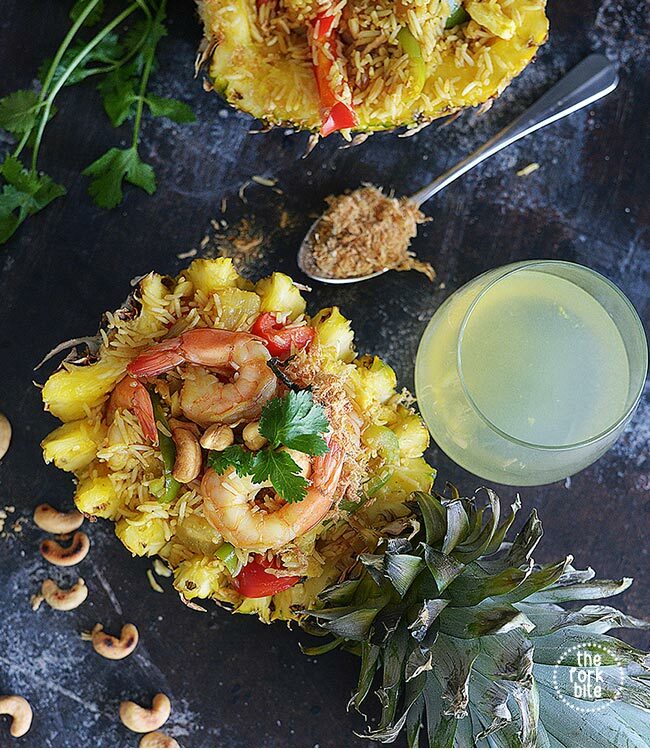 Thai Pineapple fried rice, the name alone is making me hungry. This recipe sounds absolutely super delicious, would love to try this out. This looks so good. And I am totally getting some tropical vibes. I need to try this recipe soon. That pineapple fried rice looks incredibly delicious! Also, I liked that you gave options for vegetarians and non-vegetarians! 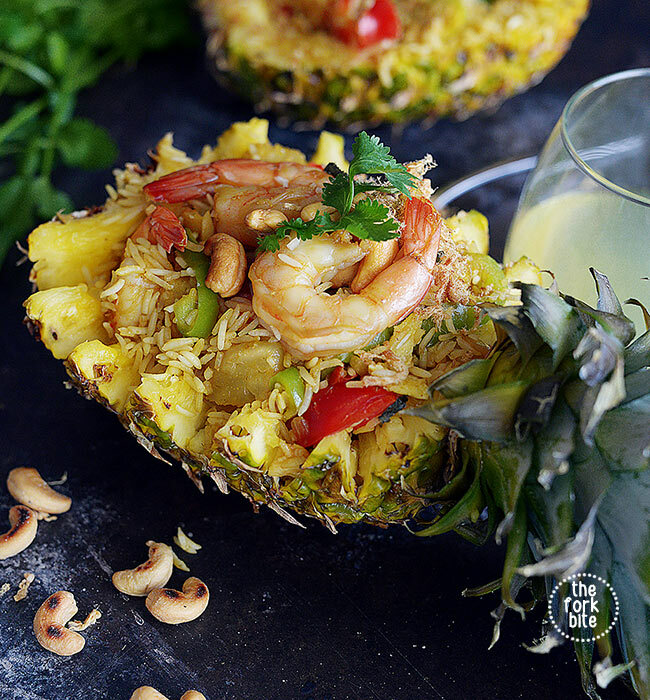 Thai Pineapple Fried Rice… i dont know but this sounds really amazing and i can just imagine how great it will taste. I have to try this. This recipe sounds absolutely super delicious! I would love to make this recipe to try! As someone accustomed to rice variations, I really like how fresh this is to my eyes and knowledge. Usually I would have a separate dish with it but this looks easy to customize as a recipe. Well done! 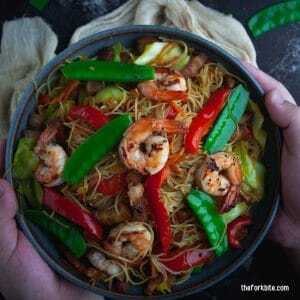 I’ve always wanted to give this recipe a try! I think it’s packed with flavor and something that my husband and I would enjoy as well. Thanks for the tips on how to make this recipe perfect! So, for me, this has allergy written all over it with thick dark permanent marker. BUT, it looks like something my fiance would die for in an entirely different way. I love the creativity of actually placing it inside a pineapple instead of on a plate or in a bowl! I had pineapple in a curry once and since then I always add it when I cook at home. I like its flavour and I can imagine how delicious this fried rice must be. And the presentation looks gorgeous!